I wanted to pass this along to the tiny "hyper exclusive" J-body peeps in California. 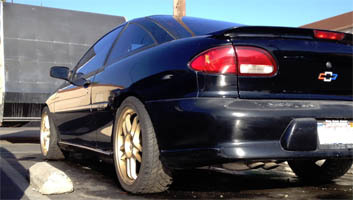 The GMPP M62 supercharger kit for Chevrolet Cavalier and Pontiac Sunfire is C.A.R.B. approved and has been since 2005. So in theory all that is required to get a 100% street legal boosted Sunfire is to buy a M62 kit (might be hard to do), install said kit, take the entire situation to the highly rated GM dealer in your area (again, might be hard to do), have them flash this new supercharger PCM tune, part number 16001591 to your car, and bam! Street legal boost. Keep us posted on the boosted project! I'm in California and still have my Cavalier. CA has best fuel? 91 piss gas. I still have my cavalier. And i have an gm xtreme tuner kit yet to install. I am in Sacramento. Also have to fix second blown clutch line.